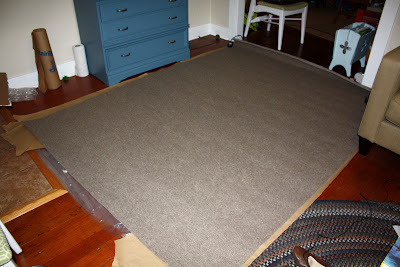 Lately I've seen a lot of people blogging about painting rugs so I thought I'd give it a try. I was still a bit skeptical about the results so I decided to buy a cheap rug and see what I could do. I found an indoor/outdoor rug on Home Depot's website for around $15 so I wasn't worried about wasting too much money if I ruined it. It for sure is nothing fancy, I think I read somewhere that it was made from recycled plastic! When I first thought about painting a rug I thought a stenciled pattern would be neat but I had second thoughts so I settled on a simple stripe pattern. We have a small dining room and I thought an intricate pattern might make the room look too busy ......... and stripes would be much easier to paint! I laid out the rug in our living room (my work space) and got ready to measure and tape out my stripes. Well, since my rug had a felt like texture the tape would not stick! So I decided to use a cardboard edge as my guide and move it along as I went. 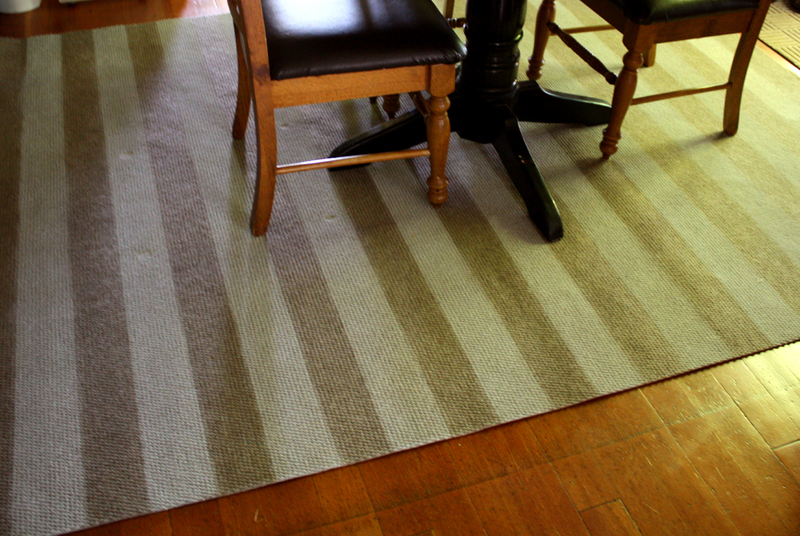 The rug had a somewhat striped texture so I would just follow the texture for painting my stripe. I quickly found out that painting the stripes by hand would take FOREVER so I gave up that technique and thought I would try spray paint. 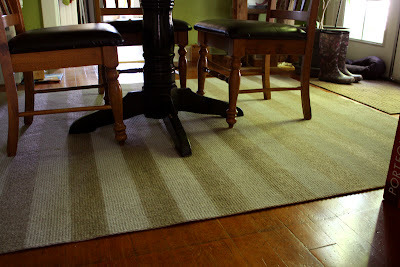 As I said before it was a cheap rug so I was willing to try anything. So this time I moved to the backyard, I refrain from spray painting in the house :o) I used some long paper to mark out my stripes and then got to work painting. It was still somewhat slow going as I would measure one stripe at a time, paint, then move on to the next stripe. 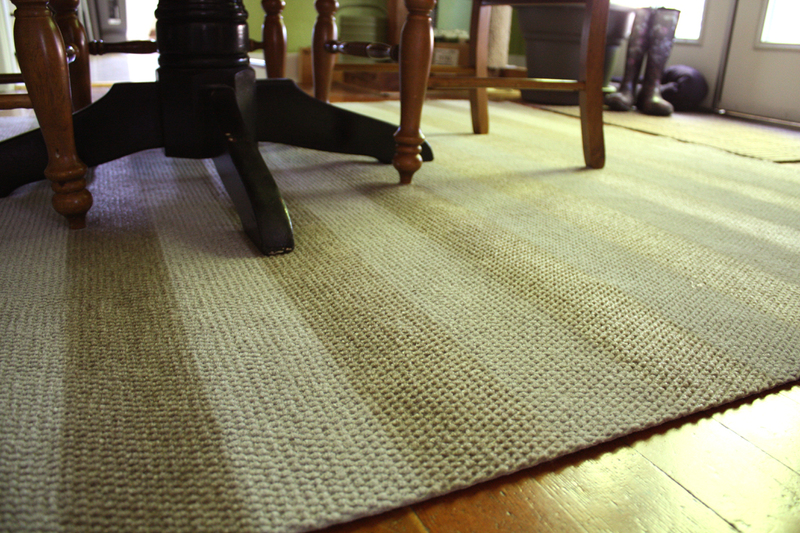 After about an hour of work I got through a bit over half the rug. It was starting to get a bit windy so I called it a day. Overall I think it turned out quite well. 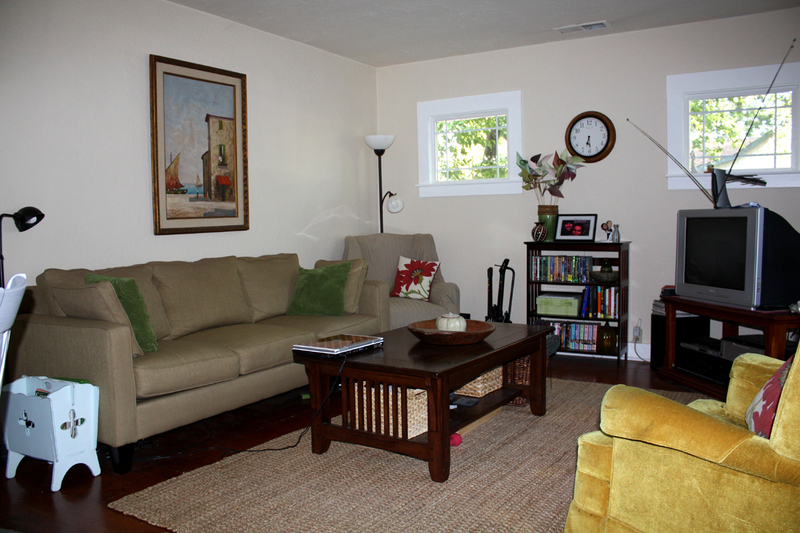 The painting might have worked a bit better on a something like a sisal rug where the weave is tight with longer fibers. 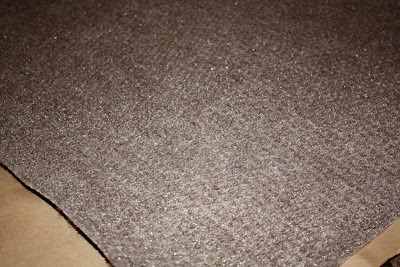 But for a $15 rug and a few cans of spray paint it looks pretty good. 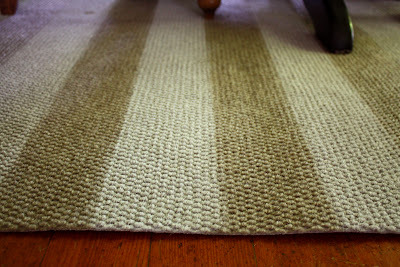 So I'm here to confirm what I've read on other blogs, it is possible to paint a rug! I'm getting ready to paint a rug myself and I'm so nervous! The more I see the more confidence I get. Your's looks great! Thanks so much for sharing! Good luck! Yeah, it is a bit scary getting started but it seems to work pretty well. Thanks for stopping by! Hi, just popped by to check out your Painted Rug! Great job!! I may be heading to Home Depot to try my hand at painting one too!! Thanks for the inspiration! That looks really good! I had no idea you could paint a rug??!! Wow, learn something new everyday :). Check out my new blog design if you'd like!! Great job done! Looks fabulous. That looks really good! I had no idea you could paint a rug??! !